I’m Snack Kid and the Toothfairy Island Kid’s Corner was designed just for us! There are all kinds of fun things to do here. If you are interested in reading they have the story of Toothfairy Island. 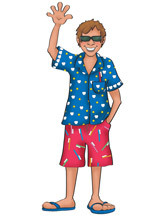 Some kids love to color and there are coloring pages that can be downloaded that have information about the people who live on the island with me—there is one about me too. One of the things I especially like about this page is that you can connect to other interesting sites. There is so much to do here and lots of useful information on how to keep your mouth and body healthy and strong. I hope you and your friends will have as much fun here as I do! Living on Toothfairy Island is a playful, impish, fun loving, pink bubble dragon named Bubbles. She is the little sister of Suds. Like her brother Suds, she loves to teach young children how to stay clean. 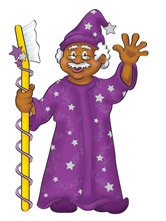 She sometimes works with Felica and Fredrico Floss to teach children how to remove the sticky plaque from their teeth. She also helps her brother Suds teach children how to wash their hands and brush their teeth. Although well loved by her brother, at times he is certain that her only goal in life is to drive him crazy. Zip! Zing! Zang! Watch out for “Bleep” as he zooms around the island. 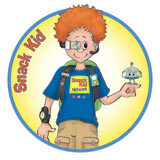 This little mechanical robot friend of Snack Kid is always full of “Zenergy”! Bleep and Snack Kid are very aware that children need to make good choices in foods, especially snacks, so they can have healthy bodies and keep up their energy! Aunt Dottie, who is in charge of the Toothfairy Island Kitchen, keeps them both on their toes making and trying new snacks. Then they all teach children around the world how to eat healthier. Bleep is a whiz at detecting what is a “body and toothfriendly” food. Snack Kid has many magical tools in his back pack for finding good foods in stores, fairs and restaurants, but the one he most often uses is his computer shirt. Hit a couple of buttons and the information pops up on his chest screen for all to read. Kids love to magically zoom along with him and Bleep for field trips to their local school cafeteria, markets, and movie theatres. What fun, a magical ride and a great time learning! Suds Bubblebottom is a young bubble dragon, even though he is almost 7 feet tall! He lives next to the waterfall at Giggle Springs, along with his little sister Bubbles, his mother Cozy and father Bertram. His father runs a small, but world famous manufacturing plant that makes beautiful soaps, deliciously flavored tooth paste and fun rainbow toothbrushes from the special spring waters. 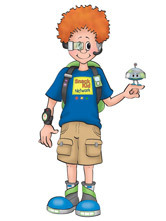 Suds loves to visit schools and dental centers where he teaches the importance of good personal hygiene habits, such as washing hands and brushing teeth. 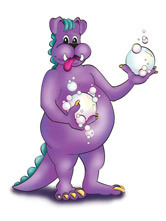 Bubble dragons are wonderful fun as they can create bubbles by just blowing the ends of their fingers. The bubbles they create instantly clean whatever they touch. But beware, because when Suds is really happy or gets really excited he has been known to “wheezle”! What is a “wheezle”? 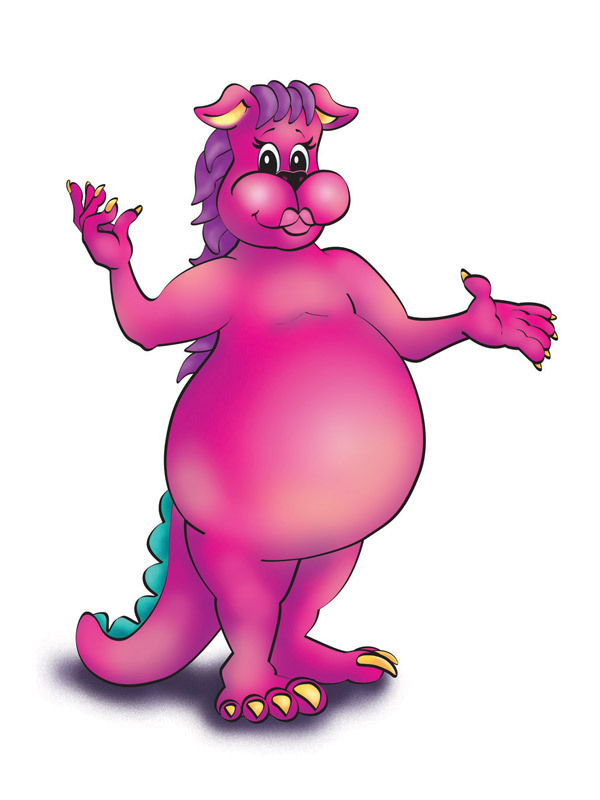 A “wheezle” is when a bubble dragon throws their arms in the air and starts spinning around on one foot as they yell “Wheeeee”! Bubbles stream from their mouth and cover everyone and everything near to them! This instantly makes people and things clean and germ free, although a bit damp. “Hi, Hy”! is a very familiar greeting heard on the island as Dr. Hy Giene buzzes by on his skateboard, bike or roller blades. 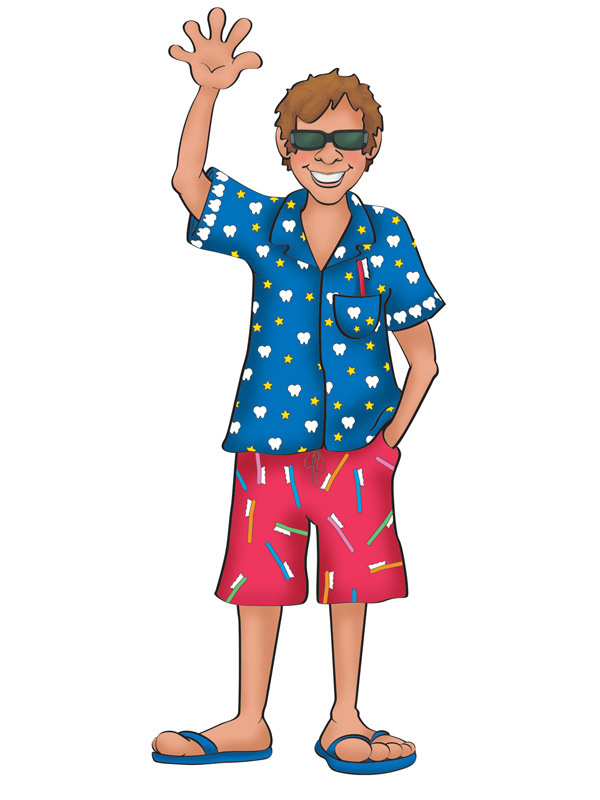 Often outfitted in sandals, bright colored shorts, a flashy casual shirt and sun glasses, Dr Hy is the fun loving, athlete that is Dean of the Toothfairy Island Medical, Dental and Hygiene Schools. Serious about his work to train the next generation of medical professionals, Dr. Hy Giene’s style still shines through in his office uniform. Students and guests love to be invited by Dr. Hy Giene on island field trips. You never know when he will hand you one of his magical toothbrushes that turns into a surfboard or bicycle right before your eyes. As an athlete, Dr. Hy Giene is aware of the importance of proper safety equipment and techniques to protect our bodies. He uses his skills to help others learn to be safe enjoying their favorite sport. Mary Toothfairy, also known as Dr. Mary Goodhealth, is a permanent resident of Toothfairy Island. She holds two important jobs: she is a dentist for children during the day. at night she instructs all the toothfairies how to collect children’s lost teeth. All the collected teeth are stored in the Toothfairy Island Research Lab and studied by doctors, dentists, and scientists from around the world. They study the teeth to find new ways to help children have better oral and full body health. Dr. Goodhealth’s days are busy seeing patients, working with dental students and advocating for children’s oral health and wellness. Dr. Mary Goodhealth knows children need to know “the how and the why” of taking good care of their bodies. Giving children and their parents the knowledge to make responsible choices regarding nutrition, oral care and good health is one of her main goals. Away from work, Mary loves to explore the island and hike with “Glo-bee” and “K-9”. Occasionally she joins Dr Hy Giene or other guests for a day of swimming, surfing or biking around the island. 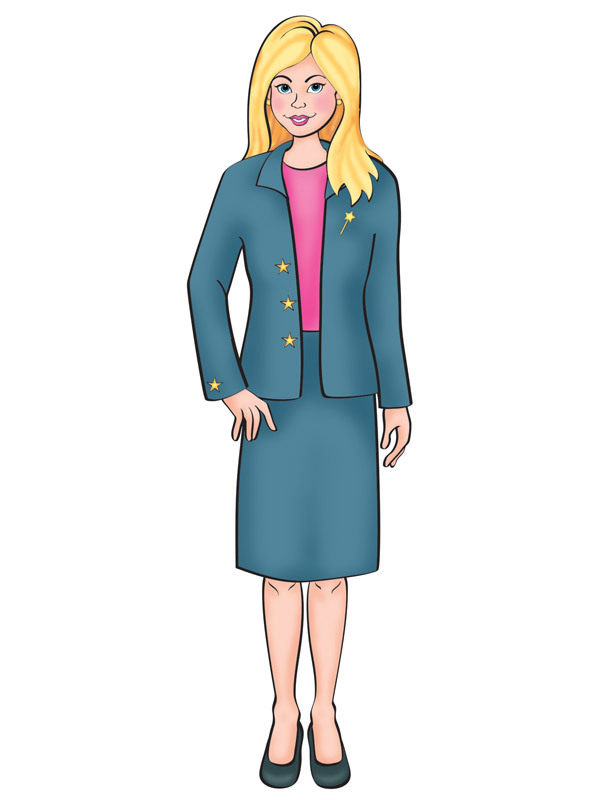 Meet Professor Seemore Science, Chief Toothfairy Island Scientist and Manager of the Toothfairy Island Research Lab. Professor Science has made his life’s work the education of children and their parents in the workings of the human body. He is aware that most people do not really understand or appreciate the science of the human body, so he invites guests on learning fieldtrips inside the body in his magical Discovery Ship. Guests can see for themselves how the body works and, as the Professor often says, “Seeing is believing”! Professor Science always carries a little magic with him as you never know when it might be needed to make a child smile. With his friendly smile and jolly personality, it is no wonder that he is a beloved member of the world’s teaching community.